If you think that by launching your website your job is done then you may want to stop and think again. While designing a website is a big part of having your own web presence, to bring it in front of an audience is just as important and could become a very time-consuming task. But there are proven shortcuts that can help you drive web traffic to your website with blogging and social media. And, since “many ways lead to Rome”, I will focus on the fastest and self-tested way to get results in 2019 with Pinterest. Surprised? If you think Pinterest is nothing more mid-thirties women pinning diet tips and parenting hacks, you are missing out on a huge traffic driver. It’s also considered more of a visual discovery engine than a typical social media channel. To put it in perspective, what Google did for information retrieval Pinterest is doing for the discovery of new ideas. And the best part, Pinterest can help you create an incredible surge in traffic for free. At first, I had doubts myself that Pinterest could skyrocket my web traffic until I strategically started to use it with consistency. In less than 6 months, I personally witnessed an increase to 250k + page views per month on Pinterest with somewhat effortless automation with Tailwind. Surely, I had to put some time aside each month to schedule my pins, find new quality pin from others to share and monitor the overall performance of it all. But in no time I’ve developed an awesome workflow that saves me hours over manual pinning and brings steady web traffic to my website. It’s basically a tiny investment of time (and money) with an amazing return! Now, you may wonder how did I get started with Pinterest? Below are the exact steps I’ve followed to grow my following and exponentially increase the web traffic to my website with Pinterest. Sign up for Pinterest & convert your account to business account. Select a display name, profile image and create the about section. Verify your website and set up rich pins for your website. Create Pinterest boards related to your business/niche and overall topics. Upload cover images for each board to give your Pinterest profile unified look. Take advantage of board section to keep your pins organized and neat. Create eye-catching pins with attention-grabbing images and engaging description. Use relevant & trending hashtags at the end of the description. Upload pin to your primary board and follow the Best Practice Pinterest Tips. Sign up for Tailwind (free trial) to schedule, repin and automate your own pins. Join Tailwind Tribes to get pin suggestions from other users and share your own pins. Monitor your Pinterest activity with Tailwind insights and analytics. Join Group Board on Pinterest to share your pins with others and re-share their content. Search PinGroupie for group boards or contact owners directly to gain access. Consider adding Pinterest Ads for your top performing pins. Conclusion: One Pin at a Time to More Web Traffic! 250 million people turn to Pinterest each month to find inspiration, education, and information. Your website could be one of their destinations. 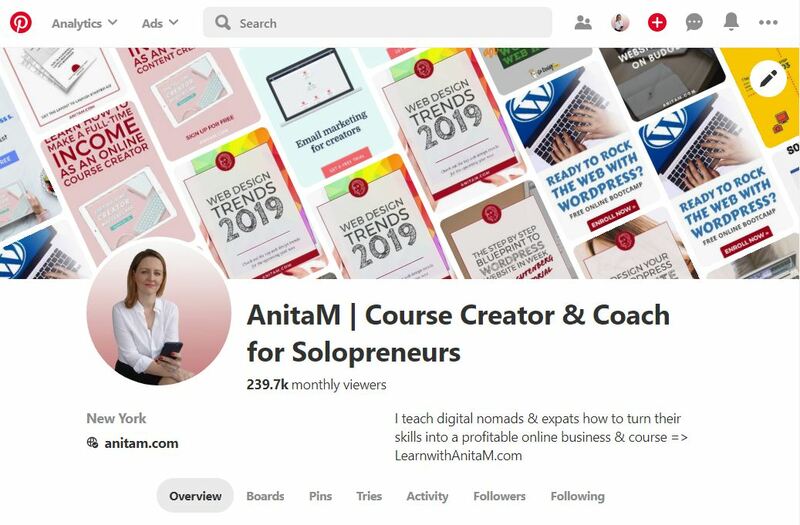 And alone the potential to grow web traffic to your website with automation tools like Tailwind, the long life-span of pins, opportunity to create viral pins and various ways of promoting your efforts makes it a no-brainer to join Pinterest right now. Don’t believe me? See for yourself some of the results you can achieve with Tailwind. Are you a Pinterest veteran and have additional tips & tricks to contribute?